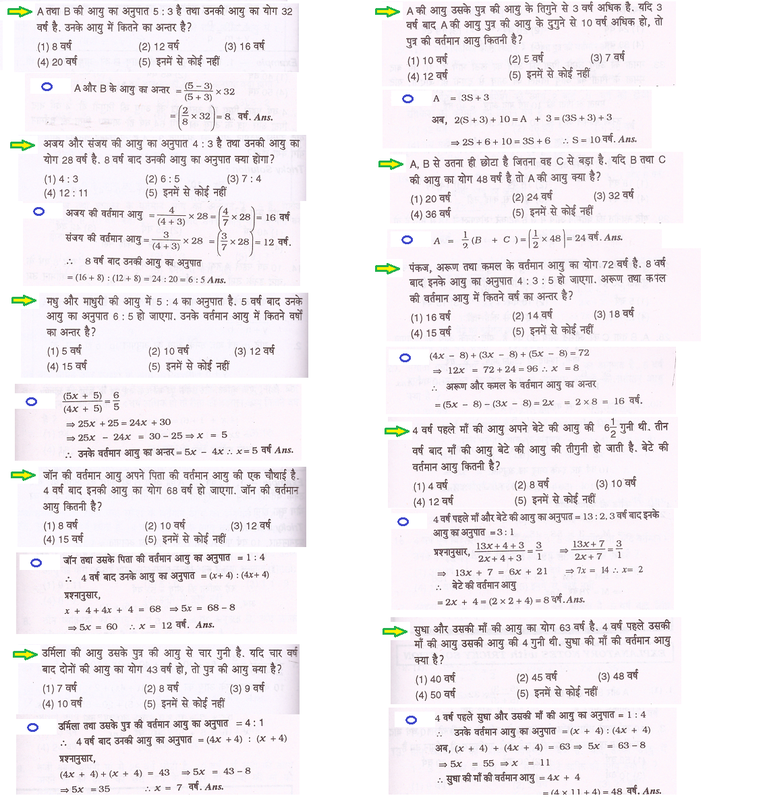 In this article we are going to show some most important types and short tricks of Age problems in Hindi as well as English. The article contain types, tricks, frequently asked important questions and a problem sheet; which helps to improve your knowledge. 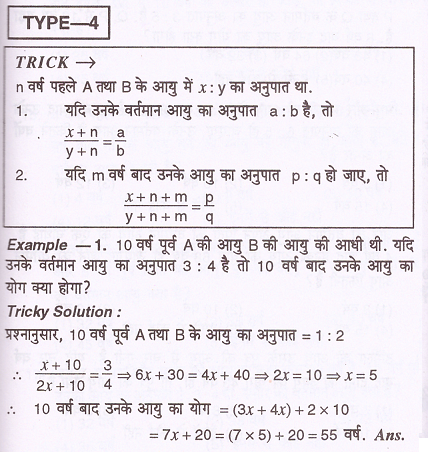 Please practice with all tricks and questions which gives you more confidence for all competitive exam. 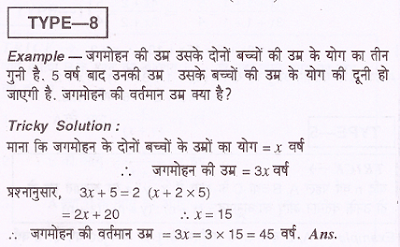 Example:- The ratio of age of Ajay and Vijay is 3:4. If sum of there age is 84 years, then find the age of Ajay. Rajeev’s age after 16 years will be 5 times his age 5 years back, What is the present age of Rajeev? Rajeev’s age after 15 years = (x + 15) years. Rajeev’s age 5 years back = (x — 5) years. 4x = 40 _ x 10. Hence, Rajeev’s present age 10 years. 3 times as old as the younger one, find their present ages. Let. the age of the younger person be x years. Then. age of the elder person = (x + 16) years. Hence their present ages are 14 years and 30 years. twice as old as his son. What are their present ages? Let son’s age 8 years ago be x years. Then, Rohit’s age 8 years ago = 4x years. Son’s age after 8 years = (x + 8) + 8 = (x + 16) years. Rohit’s age after 8 years. = (4x + 8) + 8 = (4x + 16) years. = (4x + 8) = 40 years. Four years hence, this ratio would become 7: 8. How old is Sachin ? Let Gaurav’s and Sachin’s ages one year ago be 6x and 7x years respectively Then. Sechin’i, age 4 years hence = (7x + 1)+ 4 => (7x + 5) years. Hence, Sachin’s present age = (7x + 1) = 36 years. ago, the ratio of their ages was 1 : 5. What is Abbay, father’s age at present? 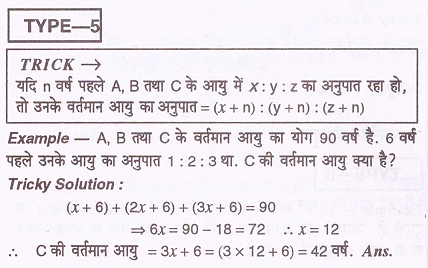 Abhay’s age after 6 years = (x + 10) + 6 = (x + 16) years. Father’s age after 6 years = (5x + 10) + 6 = (5x + 16) years. 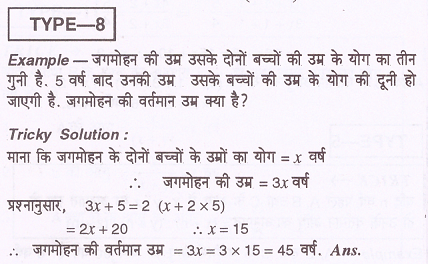 Example:- The ratio of present age of Ram and Shyam is 3:2. After 4 years Ram is elder then Shyam by 6 years, find the present age of Shyam. 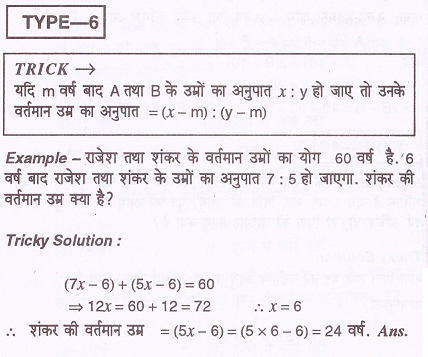 Example:- Before 10 years age of A is half of B. If ratio of there present age is 3:4, then what will be the sum of there age presently ? Example:- Before 10 years age of A is half of B. 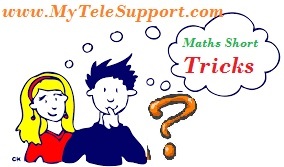 If ratio of there present age is 3:4, then what will be the sum of there age after 10 years ? 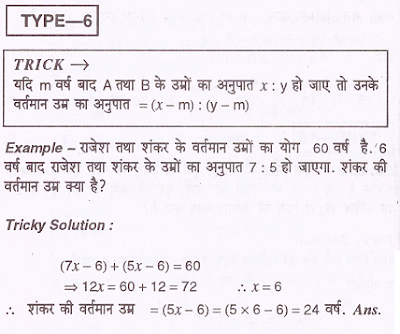 Example:- Sum of present age of A , B and C is 90 years. Before 6 years the ratio of there age is 1:2:3. find the present age of C.
Example:- Sum of present age of Rajesh and Shankar is 60 years. after 6 years ratio of Rajesh and Shankar is 7:5. find the age of Shankar. Example:- Jayash is younger then Anil such that he is elder then Prashant. 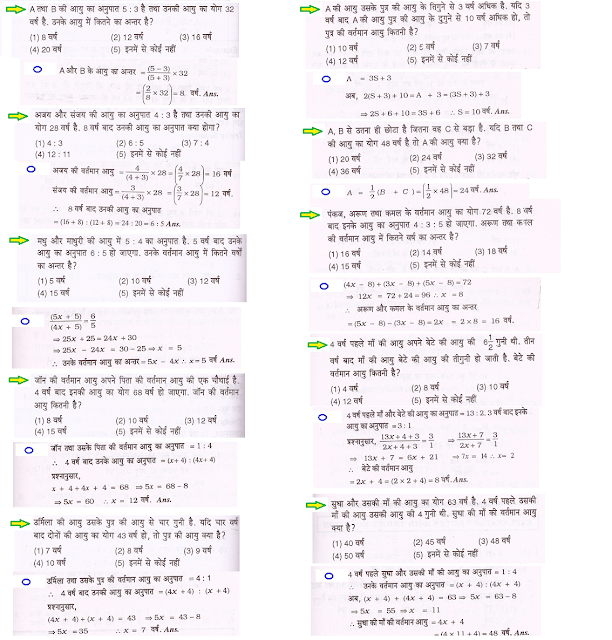 If sum of age of Anil and Prashant is 48 years, then find age of Jayash. Example:- The age of Jagmohan is triple then the age of sum of there both sons. After 5 years his age is double of there sons. Find present age of Jagmohan. 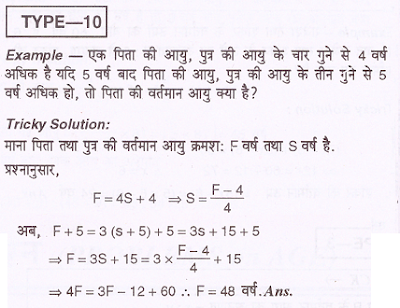 Example:- After 10 years, age of A is double of age of B before 10 years. If in present age of A is greater the B by 9 years, then find present age of B. 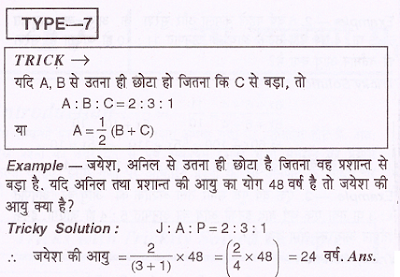 Example:- Age of father is 4 years greater then four time of age of his son. If after 5 years father's age is 5 years greater then trice of age of his son, then find present age of father. your first question is wrong according to me. you took x+15 in place of x+16.